I had some great friends growing up: through elementary, junior and senior high school and college. One of them goes back with me to the third grade! I have made many friends in my adult years, too, through church, quilting guilds, a community choir and the Omaha Press Club shows I’ve done. But today I am thinking of a group of women who joined together for a special trip back in August, 2010. Faithful women, that’s what our group was called. Marilyn Borst of The Outreach Foundation assembled us from various places, mostly the Atlanta area. Wendy Moore, Betty Saye, Mary Caroline Lindsay, Barbara Exley,and Sue Jacobsen joined me from Omaha, Emily Brink from Michigan and Kate Kotfila from New York on an exploration of the church in Lebanon and Syria. I have never traveled like that before, with a group of people I had never met. I knew Marilyn from one encounter at a church staff retreat in Omaha, but we connected over a subject that few others want to discuss with me because my passion gets inflamed and I become a bit, shall I say, too much to take? I talked about something that is in the news every day: how horribly we treat those that aren’t like us, seeing only differences and finding ways to dehumanize them. Then, I was talking about our ongoing wars in Iraq and Afghanistan and how we came to wage them. Marilyn understood where I was coming from and at the end of the day said, “I like you. I think you should come with me to the Middle East.” And that is how I got there with this amazing group of faithful women. 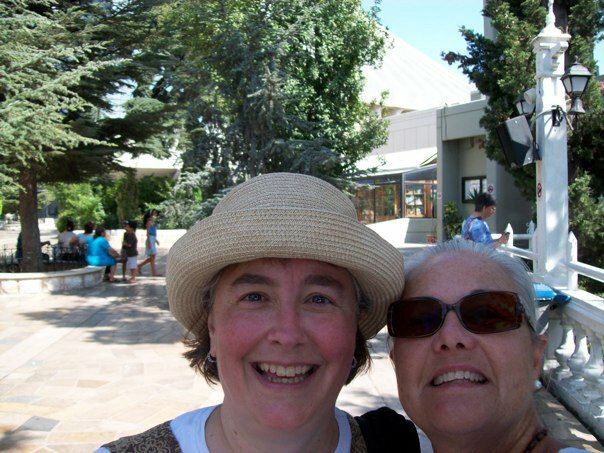 That is me and Barbara in front of a cedar tree in the mountains above Beirut, red-faced due to the heat. She put me together with Barbara. And now three and half years later, we are simply “Roomie” to each other. We’ve stood on the altar at Baalbek and been baked by the sun god on a day when it was 115 degrees…and there was no shade! We have walked the street called Straight in Damascus under that same heat during Ramadan, when it would have been more than impolite to take a drink of water when no one else was. We have visited with amazing clergymen in Aleppo, Mahardeh, Damascus, Beirut, and met with others who came to those places to see us. We have cried buckets of tears and raised countless lamentations and prayers for what they are living through now. 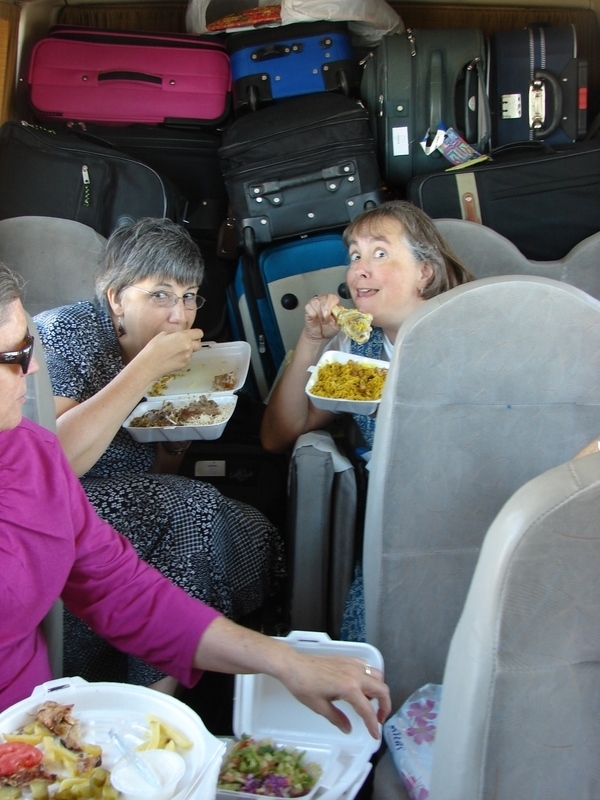 That’s Kate and me in the back of the bus, eating our famous lunch of rice and lamb shanks with no utensils. Our job was to take care of the trash and hold up all those suitcases! 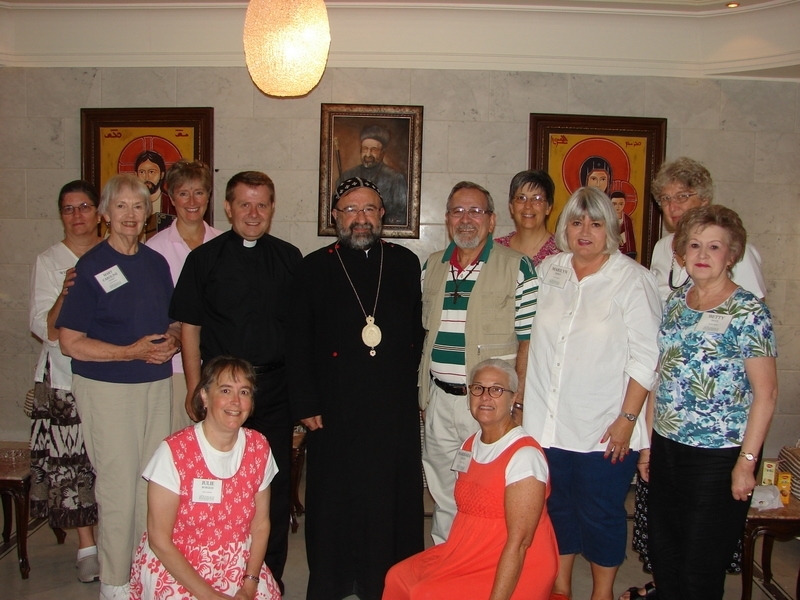 But back on that trip in 2010, we were a group of church ladies exploring our sister churches in Lebanon and Syria at a very hot time of year: August! Most of us got sick at one point or another and we took turns caring for those who were down. Baked and boiled potatoes were good remedies. We laughed on our bus rides back and forth from Beirut to Byblos, Baalbeck to Damascus, then to Aleppo and back to Dhour Choieur in Lebanon. We shopped at souks and tourist stops, buying countless scarves, prayer beads and spices. We we served bottomless cups of tea and coffee and endless sweets. And all the time we were taking in the pictures of destruction around us from prior wars, learning about what had happened in these places and how the church reacted, served and gave witness. We were on holy ground. And what I had known all the time I found to be absolutely true on that trip. We may all have differences, we are individuals after all. But we all have this in common: we are human beings made in the image of a loving God, and he said we were very good and I believe him. And I had found traveling companions – faithful women – who knew it and believed it too. And having traveled with them that far, I would go even farther. To steal a phrase from my dear Roomie, I would travel with them to the gates of hell…and the devil better look out!